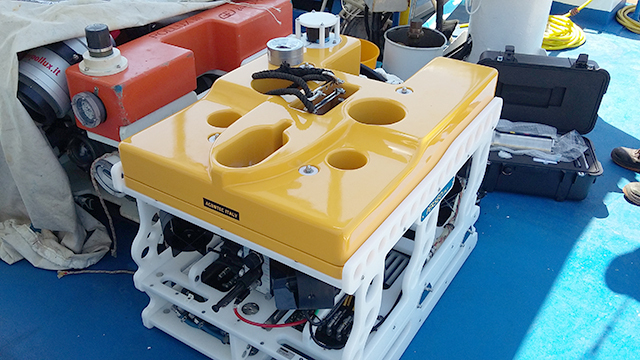 Ageotec is pleased to announce the delivery of a new ROV Perseo to ISPRA, the italian Institute for the Protection and Environmental Research. The ROV Perseo, configured according to specific customer requirements, is equipped with a Konsberg high definition camera, a double lights line ( for a total of three LEDs ), a SuperSeaPrince Sonar, a 5 functions manipulator and a 316 stainless steel winch with cable guide. Delivered in Fiumicino by Ageotec’s customer support team, the ROV Perseo has been successfully tested and installed on board the ship ASTREA, owned ISPRA, and is ready to be used by the research institute for marine studies off the coast of Sicily.